Many if not most of our wines bear “A Rockwood & Perry Selection” on the back label. 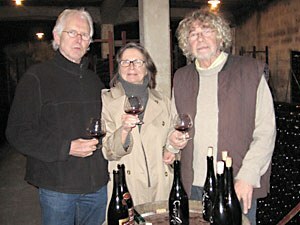 These wines are personally selected on the west coast or in Europe by Peter and Fran Rockwood. After extensive tasting in the cellars of France, Italy or California, examples are chosen on the basis of particularly high quality and then shipped directly to our storage in temperature-controlled containers. Our on-premise cellar is maintained at 55 degrees temperature and 85% humidity, considered ideal for the maturation of wine.